We love fudge around here. In the summer we head down to a local gift shop to sample some of their fudge, but around Christmas time, we like to get out our pots and pans and make up big batches of homemade fudge to eat and share. 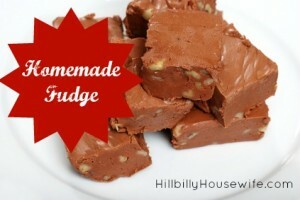 The recipe blow makes a big 5 pound batch of delicious fudge. 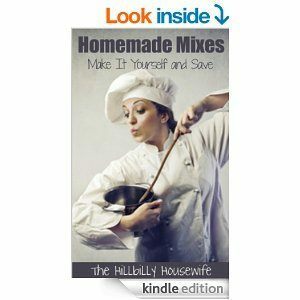 Cut it up, put it in a pretty cellophane bag and add a ribbon and you have a great little gift. Of course homemade fudge is also a big hit at holiday parties and to be honest, I like a piece (or two or three) with my coffee in the morning. I hope you and your family will enjoy it as much as we have. (And if 5 pounds of fudge sound a little overwhelming, you can easily cut the recipe in half). Place sugar and evaporated milk into a medium size pot and bring to a boil. Once milk comes to a boil add butter and boil for an additional 10 minutes. Remove pot from the heat and pour in chocolate chips and stir until they are all melted then add marshmallow crème, vanilla extract and nuts (optional). Mix well. Pour into a greased or sprayed pan and refrigerate. This recipe makes about five pounds. Tip: All ingredients in this recipe are fairly inexpensive and the recipe will yield a lot. It makes a great gift for teachers, bus drivers, and anyone else you would like to send a little “Thank You!” to.